(December 11, 2013)- A team of assessors from the Commission on Accreditation for Law Enforcement Agencies, Inc., (CALEA), will arrive on Saturday, January 11, 2014 to examine all aspects of the Cape Coral Police Department Communications Section policies, procedures, management and operations, Chief Connelly announced today. Verification by the team that the Police Department Communications Section meets the Commission’s state-of-the-art standards is part of a voluntary process to comply with accreditation best practices and demonstrate commitment to professional excellence. Telephone comments are limited to ten (10) minutes and must address the Communication Section’s ability to comply with CALEA’s standards. Standards can be viewed at Police Department headquarters, at 1100 Cultural Boulevard. Local contacts are Commander Paula Carter and Accreditation Manager Paula Fox. 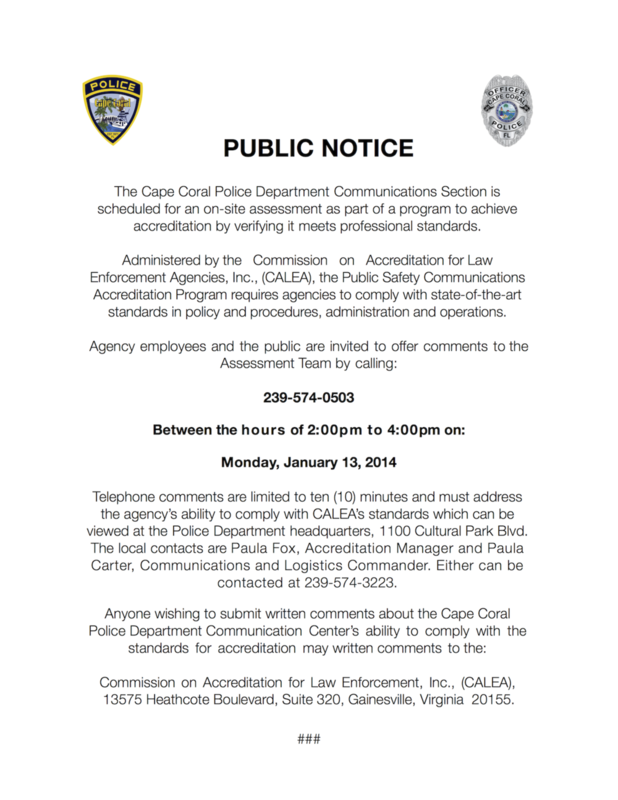 Anyone wishing to offer written comments about the Communications Section’s ability to meet standards for accreditation is requested to write to the Commission on Accreditation for Law Enforcement Agencies, Inc. (CALEA), 13575 Heathcote Boulevard, Suite 320, Gainesville, Virginia 20155. Inquiries regarding the Commission on Accreditation for Law Enforcement Agencies, Inc., can be forwarded to the Commission at the same address. Information about CALEA can be obtained at the CALEA website: www.calea.org; or by calling 1-703-352-4225. The Communications Section has to comply with 212 standards in order to achieve accredited status. The Section is thoroughly committed to constant and consistent service improvement to citizens and visitors. The Commission on Accreditation for Law Enforcement Public Safety Communications Accreditation program, standards, systems and processes, offers a unique opportunity to obtain the professional perspective from external assessors with proven management experience and track records in public safety communications. The Commission’s perspective is an important part of the Communication Center’s continuous improvement process. The assessors are Commissioner William Bleyle from the Onondaga County (NY) Department of Emergency Communications and Ms. Mary Sue Robey from the Valley Communications Center in Kent, WA. Both are professional public safety communications practitioners. Assessors review written materials, interview individuals, review Communication Center practices and visit areas where compliance with standards is witnessed. After a comprehensive review of accreditation standards, assessors report back to the CALEA Commission which decides whether full accredited status is granted to the Communications Section. Once granted, accredited status is for three years, during which the agency must submit annual reports attesting continued compliance with those standards.